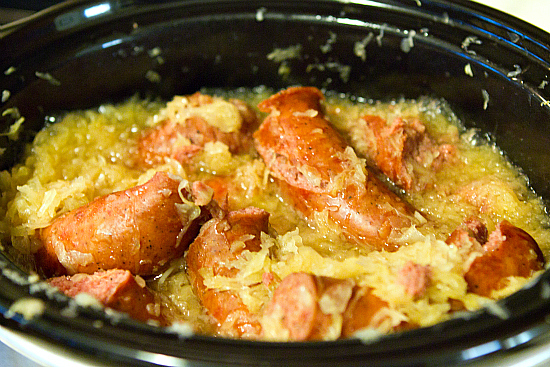 Beer & Brown Sugar Kielbasa: easy, tasty slow cooker recipe. #1: I have never been a fan of Kielbasa. #2: I am even less of a fan of sauerkraut. Yet, I am hopelessly in love with this Beer & Brown Sugar Kielbasa recipe! It doesn’t make logical sense. Could it be that beer and brown sugar make all the difference? Given the magical powers of both, it’s certainly possible. I had to try it, even though I still kind of thought I wouldn’t really be crazy about it. Forget being crazy about it, or even liking it, I loved it. Over the last few months we reminisced about how great those Kielbasa sandwiches were. Finally last weekend we scored the recipe, and within hours had it simmering away in the crock-pot. This recipe honestly couldn’t be any easier to make – less than 10 minutes to get everything into your slow cooker, and then let the cooker do the work. As with most things like this, the longer you let it cook, the better it will taste. 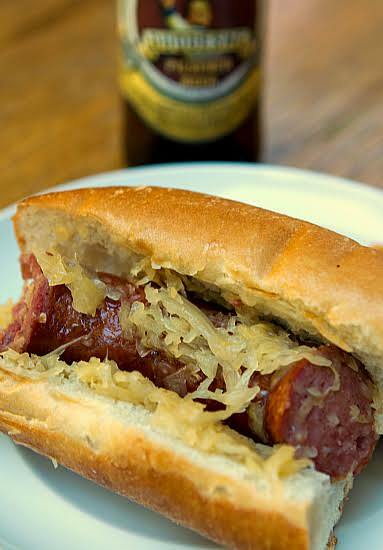 The Kielbasa becomes so tender that it melts in your mouth, and the sauerkraut takes on a sweet flavor – delicious! If you’re a Kielbasa- and/or sauerkraut-averse person, take it from one of your brethren – you NEED to give this a shot! Enjoy! Deliciousness in your slow cooker – Beer & Brown Sugar Kielbasa! Combine the beer and brown sugar in a small saucepan over medium heat, until the sugar melts and the mixture is slightly thickened; then set aside. Cut the Kielbasa into links and place in a slow cooker. Cover with the drained sauerkraut. Pour the beer & brown sugar kielbasa mixture over top. Serve on its own or in your favorite sandwich roll. Serve with a mild ale or lager and – then ENJOY – great Beer & Brown Sugar Kielbasa! Thank you Michelle of Browneyedbaker.com for your great recipe for Beer & Brown Sugar Kielbasa! We tried this Beer & Brown Sugar Kielbasa recipe in our Black Bucket Brew “brew pub” and it was great!